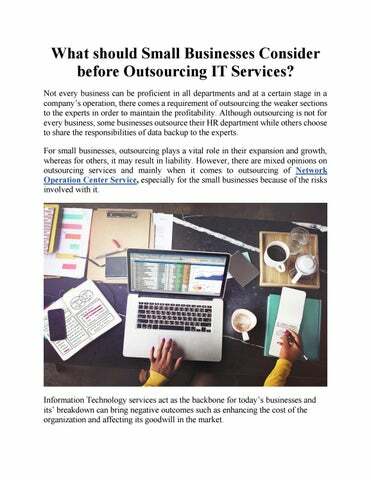 What should Small Businesses Consider before Outsourcing IT Services? Not every business can be proficient in all departments and at a certain stage in a companyâ&#x20AC;&#x2122;s operation, there comes a requirement of outsourcing the weaker sections to the experts in order to maintain the profitability. Although outsourcing is not for every business, some businesses outsource their HR department while others choose to share the responsibilities of data backup to the experts. For small businesses, outsourcing plays a vital role in their expansion and growth, whereas for others, it may result in liability. However, there are mixed opinions on outsourcing services and mainly when it comes to outsourcing of Network Operation Center Service, especially for the small businesses because of the risks involved with it. Information Technology services act as the backbone for todayâ&#x20AC;&#x2122;s businesses and itsâ&#x20AC;&#x2122; breakdown can bring negative outcomes such as enhancing the cost of the organization and affecting its goodwill in the market. Therefore, to avoid such expensive mistakes, it is necessary for businesses to consider all the risks associated with the outsourcing of IT services: ď&#x201A;ˇ Investing Money Cost is one of the major factors for every small-scale enterprise, therefore, they are required to invest the available money in the right areas so that the anticipated goals could be met. Investing in IT services is one of the key areas where the small businesses need to take an appropriate decision - it may be related to whether to hire a full-time IT expert or to outsource it to the proficient experts. The full time IT expert may be able to handle things like installation of software, detecting issues in the system, troubleshooting, etc. In the future when business will grow, it will come up with a new set of challenges that will require a big team of highly trained staff members. Primary agenda of a small-scale enterprise is to utilize the available resources optimally and the investment in hiring a full-time IT expert may not function as per the businessâ&#x20AC;&#x2122; anticipations. Thus, the best way to meet the IT requirements of the organization is outsourcing to the third party service providers.  Response Time If you’ll compare between the in-house IT team and outsourcing IT service providers based on the time taken to respond over a query, the in-house team will be much faster. However, this is not the situation every time because there may be a scenario where the in-house IT team won’t be able to tackle the situation nor the outsourced IT experts will be available 24*7. So, the organizations are required to determine the pace and the demand for IT at the workplace to choose between the available options. business solutions that will be useful for enhancing overall efficiency. Thus, if the IT plays a major role in the organizational functionality, they should consider the outscoring option, otherwise an in-house IT team can be hired. Significance of Application Support & Maintenance Services In order to enhance and extend the life of applications, its’ maintenance and management is considered as an integral element. The application is the modern reality and it changes regularly, thus, application maintenance comes into action to evolve with the changes and sometimes to be a step ahead of the changes. Nowadays, organizations are much dependent on the technology i.e. software, applications, internet, etc. for executing their day to day work. In this scenario, it becomes an obligation for the organizations to maintain and manage these aspects to avoid any sort of barriers and to keep pace with rapidly changing market demands & technology trends. “Cost of maintenance is 60% of a software’s development cost and approximately 60% of the cost of maintenance is incurred on its improvement”. The application support center is set up by the organizations to manage and customize their applications and software as per their requirements and sometimes, support services are also outsourced from experts of Application Support & Maintenance Services to derive higher returns. Access to Upgrade: Upgrades are necessary for improving organizational efficiency on a rapid basis and with every upgrade, quality, output as well as overall efficiency increases along with minimizing the occurrence of possible threats, which could lead to application failure. Moreover, upgrades are also required to retain customers’ interest. Bug Fixing: For running the system seamlessly, bug fixing is counted as the priority for the maintenance department. Primary objective of this process is to detect and eliminate the errors from the code, hardware, operating system or any part of the application. 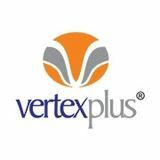 While executing this process, it is ensured that other functionalities of the application are not affected. Improvement in Performance: People engaged in the maintenance of application mainly focus on improving its performance and for the same, they regularly test the codes to avoid any type of error and failure. Reengineering and Data and coding restricting are the main parts of the application maintenance. They also ensure that applications are also safe from future vulnerabilities and threats like hacking.